I am really excited about my blog swap today! Jamielyn is such a doll and has so many great ideas! Check her out here and then head on over to her blog to see what else she has been working on! Hey! 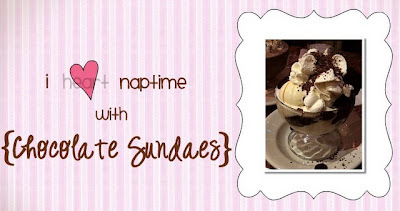 I'm Jamielyn from I ♥ naptime w/ chocolate sundaes! I’m so excited to be blogswapping with Amanda today. I just love her glazed wall art and her fun ruffled pillows, and flowers! So cute! Well let me introduce myself. I was born and raised in the lovely sunshine state ARIZONA! I am married to my best friend and have a one year old named Carson. I was born on leap year; I love chocolate, Mexican food, anything crafty, baking, and snuggling with my 2 favorite boys, Grey’s Anatomy, and the smell of a fresh coat of paint. I have to say I have the 2 best jobs in the world…being a mother to the cutest chunky monkey and being a hair stylist. I started my blog about 5 months ago, because honestly my family blog seemed to be overloaded with fun projects I had completed, or a yummy treat I baked that day. I have loved having this craft blog because it keeps me on my creative toes. AND lets face it..."I heart naptime!" That is the only part of my day I have time for fun crafty projects...which you all know we love! and our kitchen makeover we just finished! hey! I'm glad it worked... I'm still new at this whole blog swapping thing. But it was totally fun! :) Thanks for swapping with me! I just love all your fun ideas! I love the ribbon holder! Cute blog too!